Welcome to Ballinamore - your gateway to the magnificent North-West of Ireland. Ballinamore also knowing as Béal an Átha Móir meaning "mouth of the big ford”, the town got this name because it was the main crossing point of the Yellow River, between St. John’s Lough and Garadice Lough, now knowing as the Ballinamore-Ballyconnell canal built to link the rivers Erne and Shannon in the 1840’s. The Ballinamore and Ballyconnell canal was opened in 1860 but it was not a success and fell into despair. Until in 1994 it was restored as the Shannon - Erne Waterways and today brings more tourists into the town of Ballinamore. 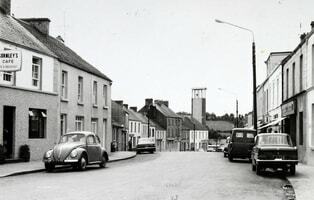 The town situated in drumlin country at the foot of Sliabh an Iarainn dates from the 1621 plantation of Leitrim with English and Scottish settlers. In that year a grant of 600 acres of land was made to Sir Fenton Parsons who undertook to build the nucleus of a town. In the 19th century the town changed very little. It consisted of one short business street Main Street and three side streets Chapel Lane (St Brigid’s Street), Church Lane (Church Street) and Pound Lane (High Street was known as Cannaboe). In addition to a small business class it had a variety of trades - copper - butcher - printer - furniture manufacturer - baker - blacksmith and dressmaker. Between 1900 and 1930 the town took on a layout it has today. Thatched houses gradually disappeared and most of its better houses were built, Cannaboe extended to meet the railway station and became High Street. On the 24th October 1887 Ballinamore railway station opened, it was the headquarters of the narrow gauge Cavan & Leitrim Railway it was the point where the line from Dromod through Mohill and Ballinamore to Belturbet branched to Kiltubrid, Drumshanbo and Arigna. On the 1st April 1959 the Ballinamore railway station closed with the loss of over sixty jobs was a blow to the economy for the town. The fine red bricked station building survives today and can be located at the top of the town. Ballinamore Court House is located in the centre of the town it was built in the 1830 and is a two – storey three bay building. The central bay. In addition to the courthouse it had a bridewell and residential quarters for the keeper of the bridewell. It is the town’s most prominent cut-stone building. In 2016 a Commemorative Plaque was placed on the outside of the Court House to mark the Easter Rising of 1916. The oldest building in the town is Church of Ireland located on Church Street built in the 1780’s from the ruins of the local Roman Catholic Church (St Patrick’s) demolished during the reformation and penal laws. Nearby is the Oughteragh (Church of Ireland) parish school. Ballinamore Heritage Trail: Six monoliths are located around the town which detail the history and heritage of the area. Points along the trail include: The Old Barracks, The Courthouse and The Ballinamore Railway. Ballinamore is widely acknowledged as an angler’s paradise – with 28 lakes within 5 mile radius and some 17 km of riverbank, Ballinamore has hosted numerous national and international angling competitions, most recently the world pairs angling championship. Ballinamore has daily Local Link bus services to Dromod railway station, Carrick on Shannon and Cavan, Monday to Saturday, timetable for this local link can be found on display in the Ballinamore Tourism Office.